According to a report by the World Health Organization (WHO), the world has over 360 million people with hearing impairment, which further includes a dreadful number of children (32 million). Further, due to limited or no ability to communicate, often the hearing disability causes a significant impact on everyday lives of such people. This causes feeling of loneliness, isolation and frustration for the hearing impaired people, particularly among children and old age people. Various technologies have been developed for deaf people, such as sign language recognition, Google Glass™, and solar-powered hearing aids. Further, all these technologies have, in some way or other, made the lives of deaf people easier. 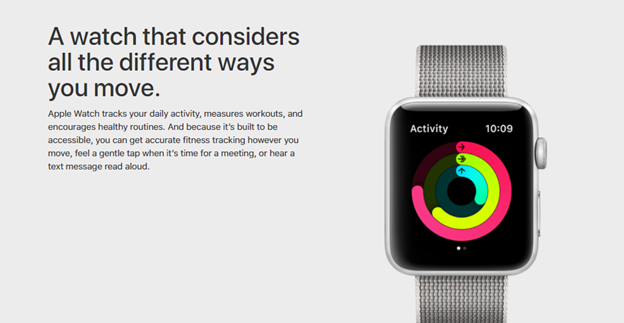 Now, the tech giant Apple™ has taken up this initiative to help the deaf and partially deaf people to enjoy “Music”. Yes, as eerie as it may sound, but Apple™ has finally decided to open the world of sound for the hearing impaired. A recent patent by Apple™ discloses a method for converting audio to haptic feedback in an electronic device. Music is a language that has the ability to attract and bind us all together. Technically stating, music is nothing but a combination of audio signals having a frequency. Further, the audio signals can have wide range of frequencies that may be classified as low frequency, medium frequency, and high frequency. Further, for the people to enjoy all kinds of music, the people must have the ability to hear all frequency ranges. For example, if a partially deaf person cannot hear high frequency, the partially deaf person will not be able to enjoy such music. This is because the hearing profile of the partially deaf person doesn’t comply and align with a certain frequency range. 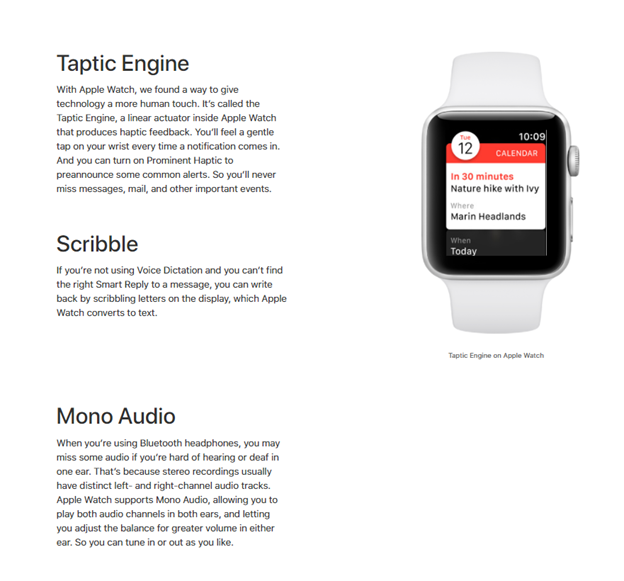 Apple™ has built an application that works on the concept of conversion of audio to haptic feedback in an electronic device (e.g., apple watch). By converting the audio into the haptic feedback, the application will atleast ensure that the deaf and the partially deaf people are able to enjoy and feel the sensation of the music being played. Not only this, the application may also help music lovers who want to augment the effects of a concert music. The application has the ability to augment a concert’s environment for a user based upon his or her choice or preference of frequencies. Further, there may be numerous implementations of this application (e.g., a smartphone application) built by Apple™. For example, a user of a mobile device may have a specific hearing impairment that renders the user partially or completely deaf to a certain range of frequencies. By shifting that particular range of high frequencies to a frequency range audible to the hearing-impaired user, and converting to a vibration pattern those frequencies in a lower frequency range that convey sound effect information, the hearing-impaired user may still be provided with the sensation of enjoying the original information in the audio data. Another implementation and a potential advantage of this application may include using the haptic mechanism of a mobile device to alert a user of specific events. For instance, a unique vibration pattern may be mapped to a certain event, such as, an earthquake and a tornado. In an exemplary scenario, the application will detect the ambient noise from the mobile device, e.g., fire alarms, screams, knock at the door, phone ringing, dog barking, music, and environmental noise. In response, a unique vibration can be actuated with the help of the application. Further, the horizon of the invention can be as vast as where the imagination can go. In one instance, the application may also help even the deaf people to learn and enjoy playing a musical instrument. For example, a hearing-impaired user will play a note on the musical instrument (e.g., a piano) and concurrently the user will receive the haptic feedback form the mobile device operated by the user. The haptic feedback will inform the hearing-impaired user whether he or she is playing the musical instrument in the correct tune or playing a song correctly. Marching into the details, the application first creates a hearing profile for a user. The user may be a normal person with no hearing disability, a partially deaf person and a completely deaf person. The application also allows the user to input hearing preferences. Here, the user can upload his or her test reports, interest and taste in music, and so on. Further, the application will play a test audio signal that is associated with a certain frequency range. Thereafter, the application will receive a user input on whether the test audio signal was heard by the user. Accordingly, the application will update the hearing profile based on the user input. Further, after the application has successfully created and stored the hearing profile associated with the user, the application will either play or receive an audio signal (e.g., a song) that is associated with a range of audio frequencies including high and low frequencies. 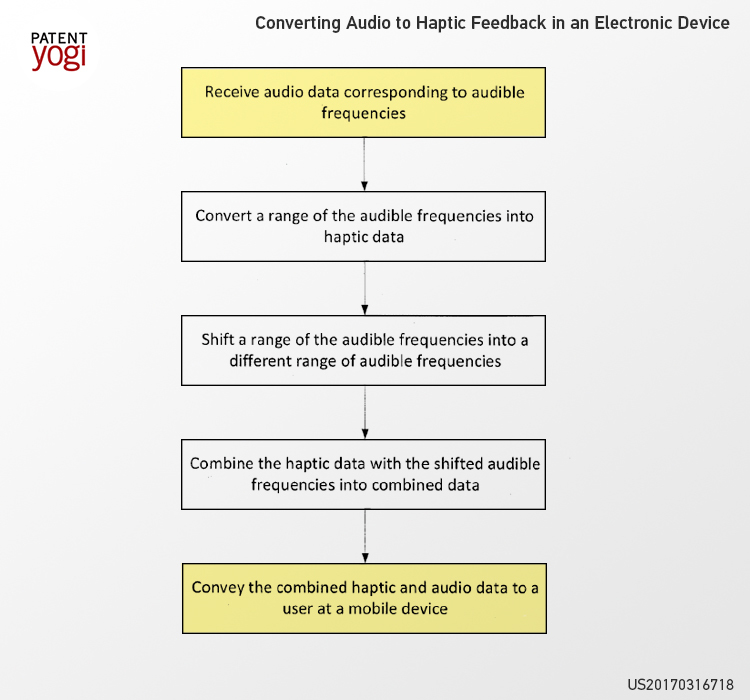 Thereafter, the application will convert a first portion of the range audio frequencies into the haptic data (e.g., converting a subset of the low frequencies to haptic data). Similarly, a second portion of the range of audio frequencies may be shifted down to lower audio frequencies (e.g., converting a subset of the high frequencies to low frequencies). Further, the application will present converted first portion and the shifted second portion to the user. Presenting the converted first portion may comprise providing the user with the haptic feedback (e.g., vibration) via a haptic mechanism associated with the electronic device (e.g., an iPhone, iPad, a tablet and laptop) operated by the user. Similarly, the shifted second portion may comprise providing the user with sounds (e.g. the song) corresponding to the shifted second portion via an audio output mechanism associated with the electronic device operated by the user. As you must have realized by now, there can be no limitation to this invention recently patented by Apple™. Well, if you think the same, why don’t you let us know your ideas where this invention can be applied so that we create a better society for the handicapped people? Previous PostAmazon warehouse workers to get state of the art augmented reality equipment. Now they might get more bathroom breaks.